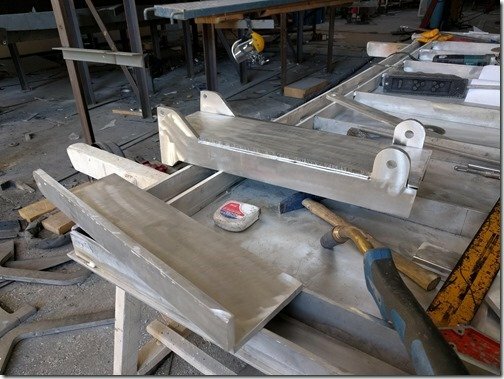 While I spent this past week up in Amsterdam walking the miles of aisles of the HUGE METS 2018 Marine Equipment & Trades Show the rest of Team Möbius was hard at work getting the frames for the tank access ports welded to the tank tops and they also started work making the big hatch lid that seals off the access hatch into the Engine Room as well as the big hinges for the arch we showed you last week as well. Let’s go take a look ………………. 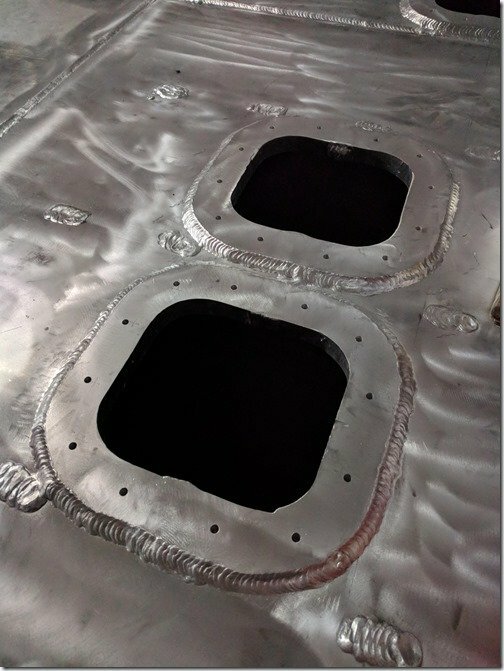 You wouldn’t think that we would be happy to see all these big holes cut into all the tanks that had just been so carefully welded up and pressure tested to make sure they were all sealed tight. But you’d be wrong! I need to have a way to access the inside of all those many baffled sections within each of the 14 fuel and water tanks that create the lattice type grid of the below the waterline portion of the hull on Möbius and that is what these access ports are for. In last week’s blog post you saw the two halves of these 25mm thick frames being welded and the rectangular holes being cut into the tank tops and now you can see how these frames are welded around the perimeter of all those tank top holes. The series of small holes you see around the surface of each frame are threaded for the 8mm SS bolts which will be used to clamp the 6mm thick lid plates down to the frames with special fuel safe gasket material in between to seal them tight. The inside dimension of these frames is about 250mm/10” square which gives plenty of room for me to reach in all the way to the bottom of the deepest part of the ends of each baffled tank compartment with something like a big vacuum hose if it were ever neccessary to remove any buildup of debris in any of these tanks over the years of use. We go to great lengths to reduce the possibility of any contaminants entering our tanks. The only source of fresh water to fill the water tanks is our high capacity water maker, never any water from shore side sources, so we know that it is always very pure and clean. For the diesel fuel we have an Alfa Laval centrifuge that removes even the tiniest of particles as well as any water or other contaminants which might be in fuel we take onboard so we expect our tanks to stay extremely clean at all times. 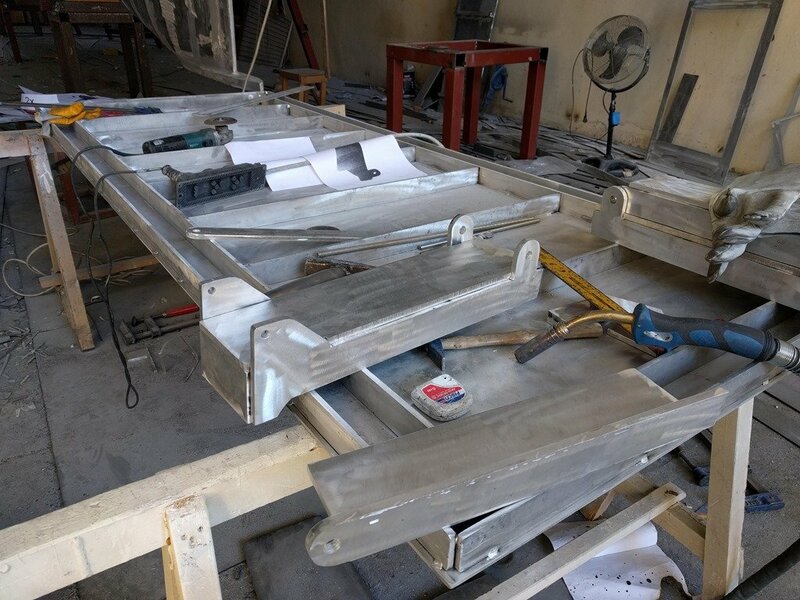 These frames will now have all their edges and welds cleaned up and the lids and gaskets will be bolted down for the last pressure test to make sure all tanks are fully sealed. Once that is done and they have been all pressure washed and cleaned the tanks will await their first fill up. Oh, and BTW, we are now accepting any and all contributions to the first fuel fill up! I’ll let you do the math but the total volume of all our fuel tanks combined is over 14,500 liters/3825 US Gals. Several of you have asked about the water tanks I mentioned that were on either side of the engine and CPP gearbox beds and this shot inside the Engine Room will show more clearly how these tanks fit in here. In addition to the fresh water they hold, these tanks also help add more mass to this area of the hull which will absorb some of the vibration and noise transfer and with our help ensure that Möbius is nice and quiet throughout when we are on passages and Mr. G is quietly powering us to our next destination. 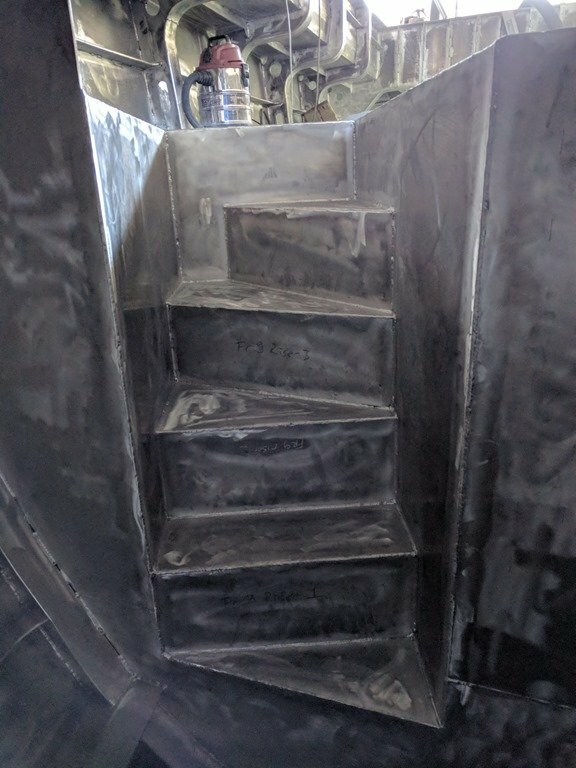 Taking a look around while we are inside the hull, the stairs going up from the Master Cabin to the front of the SuperSalon have been fully welded and cleaned up. 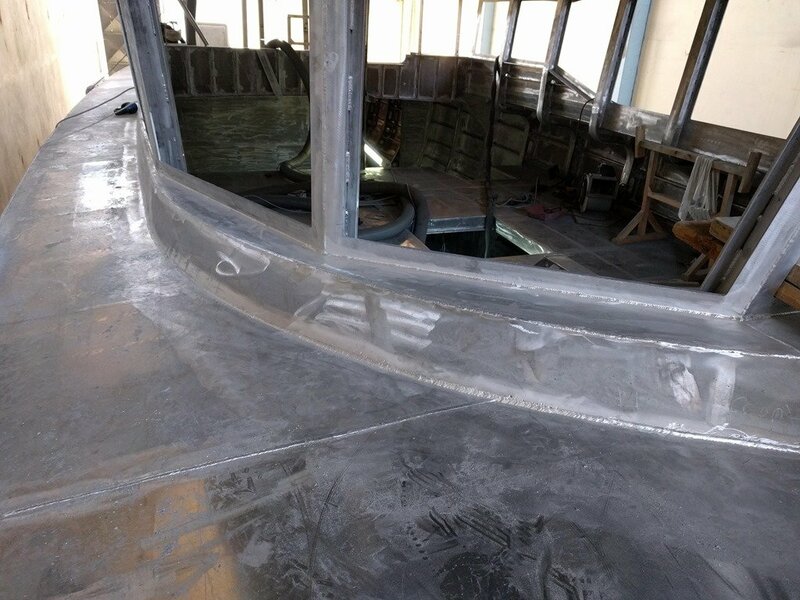 Meanwhile, up on top of the foredeck the coaming we’ve been watching as it was assembled and tacked has also been fully welded and cleaned up. 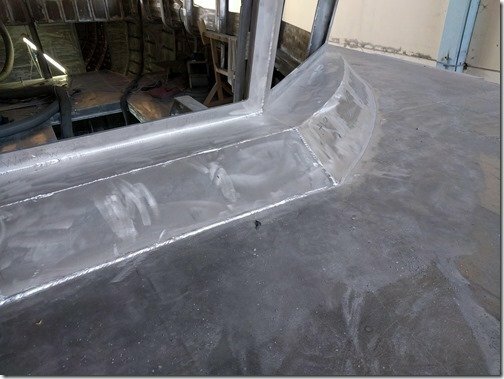 The bottom edges of the big 30+ mm/1.2” thick panes of laminated window glass will run along the tops of this coaming and the sloped edges will help deflect any green water that comes over the bow in heavy seas and manages to make it this far back. 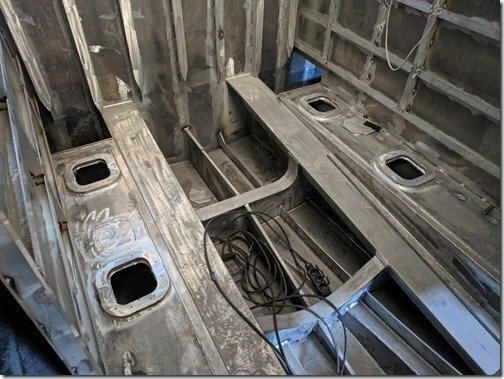 Diving down to the underwater areas at the aft end of the hull we see that the boys have been busy finishing up the welding and now smoothing out the surfaces of the prop shaft Skeg. Aluminium is just such a great material to work with and IMHO SOOOOOOOoooooo beautiful to look at as well. This closer look at the Starboard side of the Skeg shows the finished welding around the prop tube and how the welds between that 25mm thick vertical keel bar and the 15mm Skeg skin has been ground and faired smooth. Keep in mind that the outer hull surfaces which are below the waterline will all be painted, the only paint on the whole boat, because we need to have the anti fouling protection below the waterline. 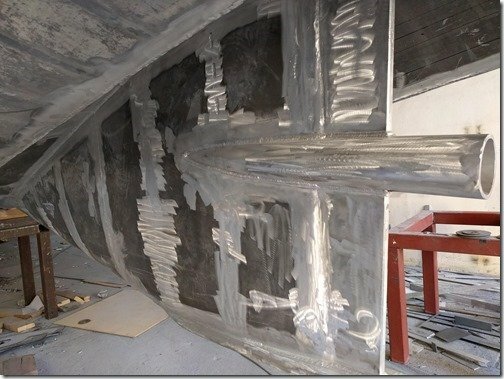 This means that we can use epoxy filler to create perfectly smooth and well radiused fillets in all the corners and transition areas which enable us to have the just right surfaces for best hydrodynamic flow of the water especially in this critical area of water feeding into our slow turning 1m diameter CPP propeller. As if that wasn’t enough, a super smooth bottom also turns Christine and me on. No, no, NO! 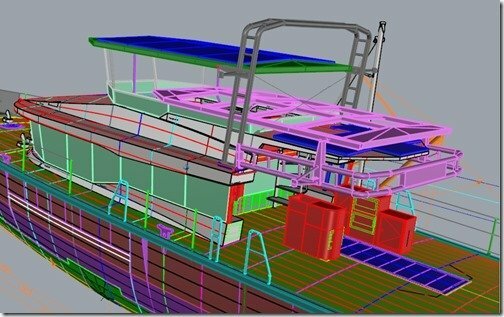 Not that way, it is just that WE are usually the ones who have to dive in and do all the cleaning and scraping of any buildup on the hull surfaces and prop. 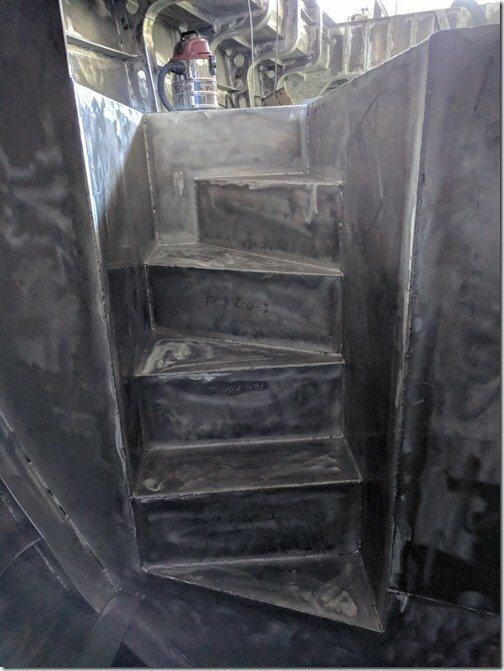 You learn over time just how much even the slightest bit of growth slows down the boat and reduces hull efficiency so we like to keep our bottoms very clean and smooth as a baby’s bum! So what’s new you ask? How about this big hatch door that goes over that big opening in the aft deck above the Engine Room. We will see this get finished up and fitted in the next few weeks but you can already see the general construction of the underside of this hatch door here. 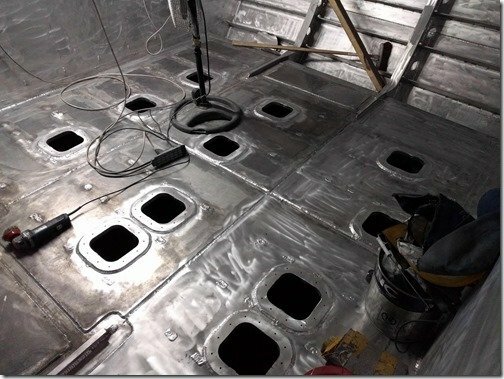 The inner framing creates the open boxed profile perimeter that will protect the rubber seal that will line the bottom perimeter surface you see here and this seal will be pressed firmly against the top edge of the opposite facing frame around the perimeter of the hatch opening welded into the aft deck. When closed, this hatch door will sit flush with the aft deck level and be covered in the same non skid material as the rest of the deck so the whole aft deck area will be completely free and clear of any obstructions. The door will have gas cylinders tucked into this perimeter area to assist in opening this door much like you’d have on the rear door of an SUV or hatchback car. There will be a series of “dogs” or handles at intervals all around the inside edges so this door can be pulled tight against the rubber seals and make sure all the water stays where it belongs; OUTSIDE the boat! This quick rendering of the aft deck and SkyBridge areas helps to show where this Blue hatch door sits overtop the Engine Room below and within the two Red ER Vent Boxes. The hatch is large enough to allow the whole Gardner and Nogva CPP gearbox assembly to be lifted into and out of the Engine Room. It will also provide me lots of fresh air and sunlight anytime I need to be down in the Engine Room doing maintenance when we are at anchor. If you didn’t catch last week’s post, the purple components in this render shows how the arch and bimini roof overtop the SkyBridge folds down to “Canal Cruise” mode. 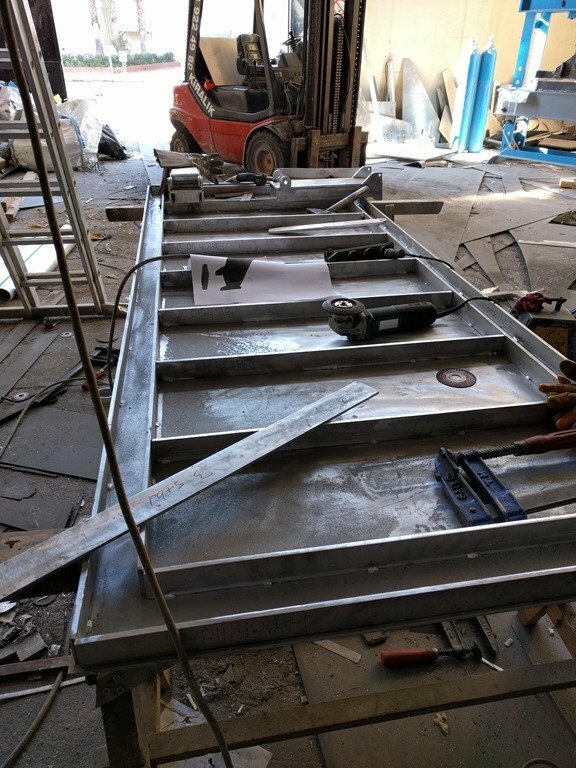 Can you guess what these aluminium things sitting atop the other end of the hatch door are for? Correct, these are the big hinges we first saw last week and you have just seen in the rendering above, that enable the arch to fold down 90 degrees to significantly reduce the “air draft” or bridge clearance, which is the height above the waterline for situations such as cruising through inland canals in some areas of the world where there are lower bridges. The regular air draft from the waterline to the top of the arch will be about 6.4m/21ft @ half load and then there will be radar and antennae above that so overall bridge deck clearance will be more like 7m/23’. Usually this is plenty of room for most bridges in seaways but by folding the arch and SkyBridge bimini roof down our bridge clearance would drop down to a svelte 4m/13’ which will open up a tremendous opportunities to explore so many more parts of the world. As you are discovering, we call these boats eXtreme eXploration eXpedition Passage Makers or XPM for good reasons! That wraps up the week that was November 12 to 16, 2018. Another fabulous week of great progress for Team Möbius and my first experience with the giant METS boat show. I will try to write up a separate post here with more about what I saw and learned at METS for those of you who might be interested in those details. Sorry but no video this week but I will do my best to make up for it next week. If all goes as planned I will have some very exciting video to show you next week as it looks like we will start moving boats including Möbius over to their new home in the brand new Naval Yachts shipyard! So stay tuned for more next week and as always be sure to add your questions and suggestions to the “Join the Discussion” box below. One of the many reasons for the name Möbius Elton. Möbius as in strip, as in the endless loop and symbol for infinity and sometimes yin/yang. Möbius has particularly strong meaning for Christine and me and I’ll tell that story later to help explain why we chose to name this new boat Möbius. Suffice it to say for now that it was a word that came up in our very first “date” and when I was designing our wedding rings I based the design on a shape I worked out with a simple little Möbius strip I made from some thin aluminium I cut from a soda can. You’d find this all the more interesting as I then had a mutual friend of ours, Ted Boardman, work up this design in 3D Studio Max which gave me the file to send off to be 3D printed in wax and then investment cast in white gold using a lost wax process. So we like endless in the form of a life of unbounded adventures! Seems fitting then doesn’t it that the building and soon operating a boat like Möbius is exactly as you noted, an endless job. With the important proviso that you and I know very well which is that if you have a “job” doing what you love then you’ll never work a day in your life! I seem to have found the best job ever as I’ve never been happier or busier than since I retired and started to sail the world, met my missing other half Christine and now have this brief time out to build a new magic carpet to get back exploring the world by sea all the more. Thanks for being such an attentive and devoted fellow explorer of life Elton, it wouldn’t be the same without you. Dinghy to be named “Klein”? Good suggestion Andy, I’ll file that one away. Or maybe Klein Vessel? Or Kleine Klein as the Deutsche might say for Little Klein Vessel? I’ll vote Kleine Klein! That is a fantastic name – and a story waiting to be told! Yes, Kleine Klein has a nice ring to it and Christine and I are suckers for a story behind most things we do so it will definately be in the top running when we get to naming our tender for Möbius. Thanks. Not sure I follow your logic for needing 2 Möbiuses (Möbi?) to make one Klein vessel/bottle as I have always understood a Klein to be a single 3D shape and surface just as a Möbius strip is a single 2D surface so you’ll need to help me with your thoughts on that? Your description of your plans for securing the access ports on the fuel tanks brings out two issues that I have been concerned about in my own planning. 1) What guidelines have you found for threading a metal as soft as aluminum? Minimum thickness? Thread size? 2) What’s the best way to deal with the galvanic corrosion issues with aluminum and SS in direct contact? I’m sure you’ve already found answers to these pesky details and would be interested in your conclusions. Hi David, glad to share what we are doing for threads in aluminium on the XPM boats. 1. Aluminium takes threads very well in my experience and I think the generally recommended thickness is 80% of the male thread OD. My general rule of thumb for the amount of threads needed in metals is to have at least 1X the thickness of the OD of the bolt, however as with most things on the XPMs I double this and then some. In the case of the 8mm SS machine screws we’ll be using to secure the tank access port lids to the frames, I spec’d 25mm so thread depth in the blind holes in the frames will be about 3X thread OD. I went this thick to also help keep those frame tops nice and flat once they are welded to the tank tops to provide the best sealing surface for the lids. The lids are 6mm thick so they would also be able to flex a bit to allow for any unevenness that might still be on the gasket surfaces. 2. 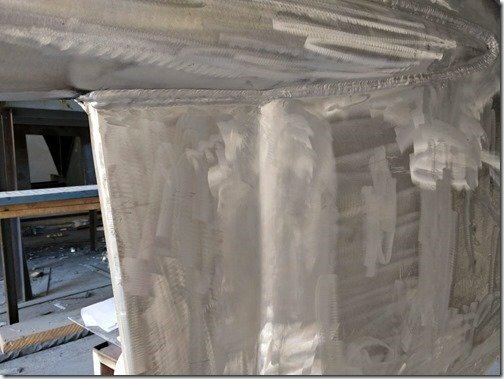 Over the years I have tried a lot of different methods for dealing with the dissimilar metal problems created when SS and aluminium are in direct contact with each other and the two I find to be most effective are generic Lanoline (sheep) grease or commercial products specific for this application such as TefGel. I’ve had very good experience with both and not had a SS/AL thread that I have coated with either of these ever seize up on me. The principle is simple, keep the 2 dissimilar metals from touching each other and with very thin gaps such as threads, these two gel or grease consistency solutions work very well. TefGel is much more expensive than Lanacote or other lanoline based greases and I suspect that it probably does a bit better job over time so my practice has been to carry both on board and to use Lanolin grease for threads where I am likely to take the SS fasteners in and out once a year or more and then use TefGel for situations where the threaded fasteners will be in place for longer than a year. You don’t need much TefGel on each thread so a tube or container of TefGel tends to last a long time and stores well. In the case of the SS machine screws securing the tank access lids I will use TefGel because most of these will be hidden under flooring and hopefully won’t need accessing very often and some perhaps never. I tend to cary quite a good supply of lanoline grease onboard as I tend to use it in a lot of applications all over the boat for things like bedding aluminium to aluminium applications. Lanoline does thin with heat so I don’t use it for situations where the coated surfaces will get more than about 40C as it tends to liquify and run out. Threads don’t seem to be as affected by temperatures up to this 40 degree point but lanoline grease does have a relatively low heat limit so I’d go to TefGel in any places where temps would get much over 40C. 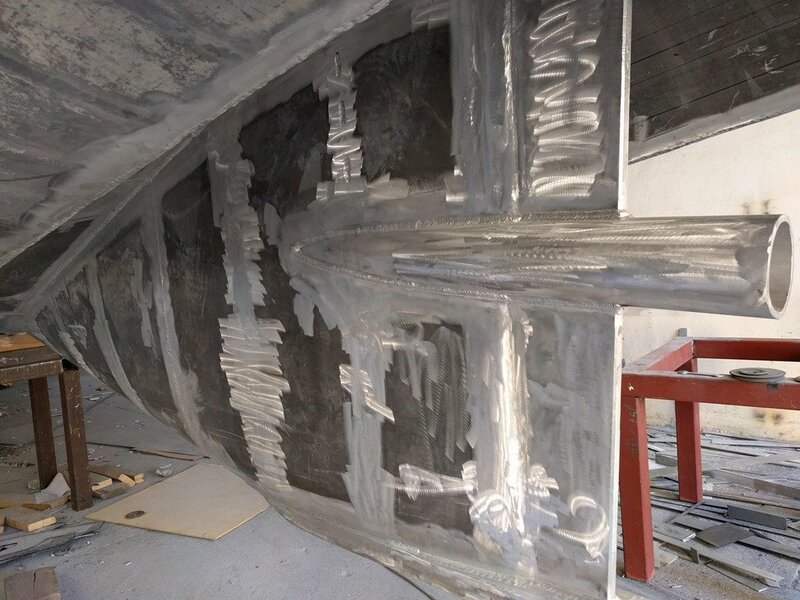 Based on your questions it sounds likely have already learned the need to keep dissimilar metals such as SS and aluminium separated from each other and I know that for my boats I make sure that EVERY SS fastener has either lanolin grease or TefGel in there. If I were to buy a used boat I would take on the significant job of going through the whole boat and removing every SS/AL thread or surfaces, coating them with one of these types of separators and putting the back together. It takes a ridiculous amount of time and effort to get them all but it is such a good investment of time compared to dealing with a seized thread or poultice corrosion that can set in when water creeps into small spaces between aluminium. These are all just my experiential learnings so you would be best to research this more thoroughly. Hope that helps and thanks for joining the discussion here, great to have you along for the adventure. She looks good. Tanks are sweet, low, and spacious. She is quickly getting very ready for the juicy bits too fallow in the new outfit shop. Very exciting move for one and all. Lots of photo’s please. Cover plates rock! The solid tunnel, shaft tube, and stern will really shine when the rudder gets hung. Looks tough and ready to hit the beast if need be. Your huge hatch looks killer strong. Great design work again. Very practical center line service hatches are often poorly placed. A stern access is a dream come true, many fun and safe nautical operations, will be smoothly preformed with inexperienced crew. Comfort and safety has been well regards with this innovative contemporary design. Its fun thinking about fast travels in this elegant ocean blaster. The 80 foot, 1926 F/V Eclipse, was one of the schooners I spent time on, she was powered with a GM8-71. She would burn 5-7 gallons a hour at 7-8 knots depending on the weather. Lollipop is going to smoke those numbers at a greater speed. We could back 80,000 pounds of cargo/fish in very heavy weather. Winter fishing in Alaskan waters is were these vessel shined.. We would ice up some, but once we put the weather on our stern, the party could start below in the for peak.. The dance was to change watch with the aft WH, and time your run between the seas. I had a stern bunk because I was the engineer for the most part. The for peak was comfortable with the heat of the oil stove, food, cards, chess, and music. My space was aft and loud next to the screaming 8-71. The Eclipse did leak, and need total attention with all the systems and old tanks. We were one the top Halibut and Black Cod vessels in Alaska for years. Lots of sea stories from a lover of the Seas. Mother Ocean you are my light. BTW did you find anything interesting at METS show? max 9 kW engine mounted generator. Quite impressive! The Integrel High Power Alternator is very impressive and I was fortunate enough to get some time with Nigel and Ken who developed this at METS. They won the DAME Award this year so that certainly backs up our mutual impressions of this unit. I am currently discussing the possible use of the Integrel on our XPM but our situation is quite different in that our CPP already addresses the key inefficiency that the Integrel goes after by moving the load curve up into the sweet spot of the engine’s fuel map so the benefits of the Integrel are not as significant as with a fixed prop setup. However there are still good gains and advantages to be had and what I’m really interested in and talking to Ken about is to just use their control box, essentially a very smart regulator, with the alternator setup I’m already planning. There is the potential advantage of the Integrel unit to make it more efficient to use the main engine as a generator when at anchor and the solar panels are not keeping the battery bank topped up. However with the battery and solar arrangement we have designed we think that this scenario will be very rare so again not sure if the Integrel will have a net gain for us or not. I will keep you and others here updated as I get time to discuss this more with the folks at Integrel and let you know what comes of our discussions.